This reminds me of the so-called Christian evangelicals who call for Muslim genocide (well, not in so many words. But…). These people are protesting the death a third brother in a family to be murdered in Newark, the victim of gun violence. The stupid phrase “gun violence” can be overlooked, as we all know guns do not act on their own. The point should be the inevitability of activists to use the same tactics they are protesting against. We should be smarter than that. I got this from Kit Pharo, a fellow cattleman. I hope people realize the unprincipled stands we’ve taken over the years is what has brought us to this tipping point. In other words ANY time a vote can supersede the constitutional limits our federal government WAS obliged to follow (always in reaction to some made up emergency), the door has been flung wide open to a disaster like we see coming. When discussing the current federal government and presidency, I often hear people say, “It can’t get any worse than this.” I disagree! There is strong evidence that it can get much worse! There are numerous polls telling us who is the favored presidential candidate. I never know which one to believe. Just for the fun of it, I started looking at the Las Vegas betting odds. They have been unbelievably accurate during the last two presidential elections. As of yesterday, Donald Trump had 9/2 odds of winning the 2016 presidential election. In other words, if you wager $2 on Trump and he wins the election, you will win $9. Marco Rubio had 5/1 odds, while Ted Cruz had 7/1 odds. These are the top three Republican candidates in the 2016 presidential race. I am terrified by the fact that Hillary Clinton had 8/11 odds of winning the 2016 presidential election. That means that if you wager $11 on Clinton and she wins the election, you will only receive $8. You will lose $3! They are so sure Hillary Clinton will win the 2016 presidential election that they will not give you any favorable odds. CLICK HERE to see the current odds. If you think it can’t get any worse, you better think again. OK you guys (and gals). Read the document you swore to uphold and get it right. Quit listening to those criminals who order you around all the time. Quit killing people who are just trying to get by (even if their culture is a bit strange and even against all you stand for). Quit spewing all those greenhouse gases flying from backward hovel to mud hut. Your job is right here. Our freedoms are under attack and it isn’t religious freedom, as the warvanglicals will have you believe in their disgusting attempt to channel your efforts into a holy war. It isn’t something a preacher or a book has to explain… really! If you are forced to act against your will it is wrong. It is never necessary to have the state act this way unless it is to punish or protect in response to people acting like the state. I’m awful close to being so arthritic and tired that if I owned a bakery and this happened to me, guns would be a’blazin’. This has got to stop. Furthermore, the gay, trans or whatever community should stand against this as well. For one thing, it could come back to haunt them as politics change in the future and for another thing, if they truly wish to have the freedom to be who they are they should wish the same for others. Thanks to all of you who read this and have a Happy New Year. By the way, not wishing a Merry Christmas to ya’ll was only a matter of timing. I wished it plenty of times while begging for the Salvation Army at Fareway. Another by the way; everyone should try the bell ringing thing. It really is a lot of fun seeing friends and strangers this time of year. Doing the surveys of shopping cart contents is particularly enlightening. Connecting the stereotype to perceived generosity is fun, yet too unscientific to be of much use. It is amazing to me that the Salvation Army has to pay bell ringers. Is it a sign of the times where our little devices preclude social interaction? Is the welfare state assumed to be so efficient that there is no need to help people we don’t know? The multitudes who dropped donations in the bucket didn’t seem to think so. I don’t think the word is out how enjoyable an experience ringing the bell can be. As we start a new calendar it is tradition to make a New Year’s resolution. With just a single goal, the task is less daunting and easier to focus on; thus achievable. Usually we procrastinate for a long time in order to enjoy the luxury of our vice as long as possible but still feel good about ourselves as we finally give up smoking, get more exercise, or call our moms more often. Whatever it is, the new year presents us with a golden opportunity. My hope is that all you people out there with great ideas resolve to share it in the public sphere through a letter to the editor. The letters are the most read section of every paper. It doesn’t take special training or exceptional skill to utter an opinion that can eventually have an effect on the world. Press releases from organizations or government dominate the media while ordinary people sit back and take it. What if the Jews and their friends in 1930’s Germany had spoken up right from the start of their oppression? If you have already achieved perfection in every other area, make a resolution to write a letter to the editor when you have something useful to share. Below is a letter I sent to Iowa Farmer Today last week. The eagles stand with wind turbines in the background. Wind turbines kill 573,000 birds (including 83,000 raptors such as eagles) and 888,000 bats per year in the United States. Promoters of wind energy boast of about 25% of our electricity coming from wind. With 40% being forecast in 2020 that means 40% of our electrical energy will be overpriced for Iowans in less than four years. “I will do anything that is basically covered by the law to reduce Berkshire’s tax rate. For example, on wind energy, we get a tax credit if we build a lot of wind farms. That’s the only reason to build them. They don’t make sense without the tax credit.” – Warren Buffet at Berkshire Hathaway’s 2014 annual meeting. Berkshire’s MidAmerican Energy has $5.6 billion invested in windmills. Harold Prior, executive director of the Iowa Wind Energy Association in 2013 said if Congress kills the wind-tax credit, “they’re getting into the business of picking winners and losers, which is what they say they don’t want to do.” See the irony? I’ve called and left messages to these people asking them what petroleum subsidies they speak of that justify wind power subsidies. Repeated tries brought no response, so I looked into it myself. One obvious oil subsidy is military protection. The cost of this intrusion in the market has been horrific, with hundreds of thousands of lives lost and trillions of taxpayer dollars squandered. With such devastating consequences from these policies, why wouldn’t alternative energy advocates lobby to stop the carnage instead of piling on more handouts? The unseen cost of petroleum subsidies is the delay of alternate source development because of taxpayer protection of a business that should have had that cost reflected in consumer prices. Shifting costs of petroleum products from the market to taxpayers keeps oil artificially low, reducing incentive to seek new energy sources. A friend reminded me of the other subsidy, the Oil Depletion Allowance. This long term scam saddles taxpayers with the cost of oil as a dwindling resource. The oil industry brought out the tired old national security and energy independence story to put this over on us; just like alternative energy scammers do today. Every time we turn around these windmills are deified, even at super extravagant, overpriced rest areas. It is a shame Iowans are so easily conned. It is just one more chapter in a long running story of trade associations lining their member’s pockets at the expense of (I hate the term, but) working families. All government, in its essence, is a conspiracy against the superior man: its one permanent object is to oppress him and cripple him… The most dangerous man to any government is the man who is able to think things out for himself, without regard to the prevailing superstitions and taboos. Almost inevitably he comes to the conclusion that the government he lives under is dishonest, insane and intolerable, and so, if he is romantic, he tries to change it. And even if he is not romantic personally he is very apt to spread discontent among those who are.The notion that a radical is one who hates his country is naïve and usually idiotic. He is, more likely, one who likes his country more than the rest of us, and is thus more disturbed than the rest of us when he sees it debauched. He is not a bad citizen turning to crime; he is a good citizen driven to despair. The climate change issue is, of course, loony nonsense and can be dismissed as democratic socialism at its best. The end goal is obviously equality of living standards between the doers and the takers. But the private property stand he takes is so blatantly hypocritical that it shows an insult to the intelligence of voters that screams ELITIST! 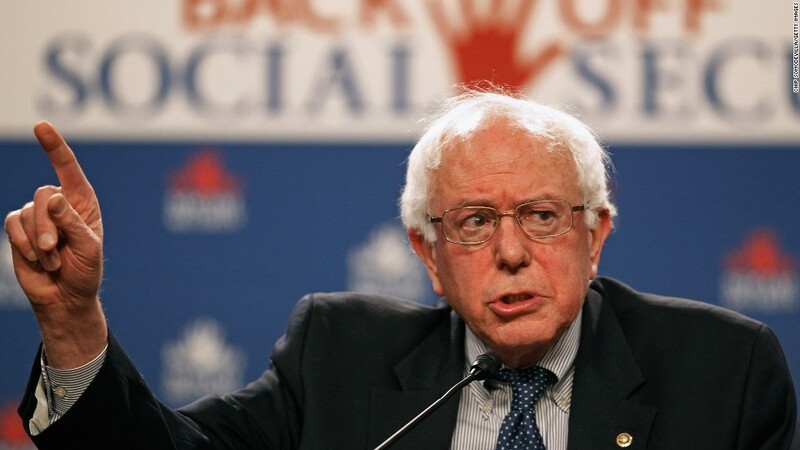 How could anyone with half a brain believe Bernie Sanders has an once of respect for private property when every promise he makes involves thieving as a way to achieve equality of income? I agree that eminent domain violates property rights in the worst way, for the common good. Bernie is either disingenuous in his opposition to the pipeline and support for “the common good,” or a liar, or a fool. Is it possible he is all three?